After being made redundant from her call centre management job, Kim persuaded husband Jim to give up his high pressure position in the corporate world and enjoy the simple life on board their own 59′ cruiser stern narrowboat with their five dogs. Here’s what Kim has to say about their new life. My name is Kim. I live with my husband, Jim and our 5 dogs. Our eldest dog is Paige, she is a Patterdale Terrier and is 16.5 years old. Then there are our Border Terrier sisters, Jess and Fern at 5 years, Bart, Jack Russell, he is 4 and Ruby, German Shepherd at 3 yrs. I used to work in Customer Service, I have managed large call centres, written and delivered training programmes for 1st line and Middle Management. I was made redundant about 4 years ago and with the support of Jim, took the decision to come out of full time work and to find something that I could do for myself. We moved to a bungalow that was needing complete refurbishment and I project managed this for 8 months. Jim had a very high pressured job for an oil company which was taking its toll on our life balance and his stress levels. I had seen some narrow boats moored up in the little village close by our home and mentioned one day that I thought it looked such a nice way of living. 2 weeks later, Jim came home and asked if I was serious about the boating thing as he had had enough in the corporate world, nights out, meetings, emails, phone calls, customers etc etc. We talked about it for a week, trying to weigh up good points and maybe not so good and then went boat hunting… Here we are. On a personal level, we have 4 children between us (youngest 20 and oldest 32) 2 gorgeous grand-daughters (aged 5 and 3) and another on the way. Our boat is called Progress. Jim has a Dog Training business called Progress DTS. This is something that he used to do as a hobby but has now decided to pursue this further. We decided to name the boat Progress as we felt it sort of fell in with his business, because we were making progress in the next stage of our life and because we felt the word progress is a positive word and this is what we both wanted to feel. We have a years mooring in Mercia Marina in Willington, Derbyshire. We felt that, as relatively new to living on a boat, that we needed some stability initially and with winter approaching (as we have only just gone onto the water), that we needed to get used to what life is like as a live-aboard, during winter, in the safety of a marina. We intend to get out there cruising come the break of the winter months and explore the canal network but have the marina to come back to. 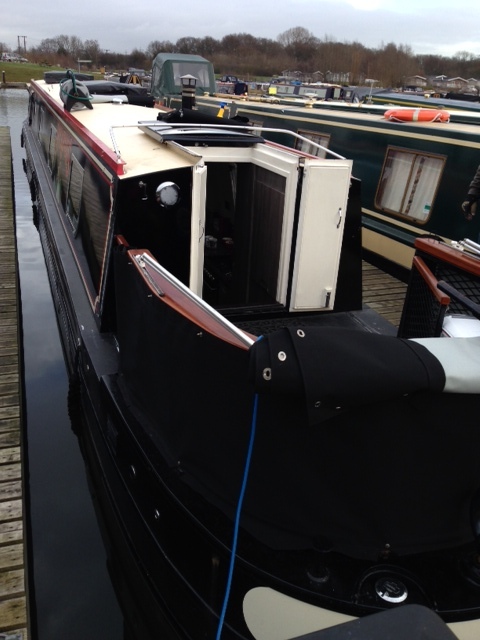 nbProgress is a 59ft Cruiser style narrow boat. We designed her from scratch. She is very modern in comparison to some boats out on the waterway network. I have seen some absolutely lovely boats, some very traditional, but, on a personal note,find the wood that you get in more traditional boats,very dark. I know that our boat would not suit everyone as we really have gone away from the traditional but we love the modern feel and can also soak up the tradition by seeing other boats go past. We have a large stern, which is gated and meshed (this is for the safety of the dogs and ourselves). We have no access to the bow other than from the outside because we have utilised the whole bow area in a large bed. 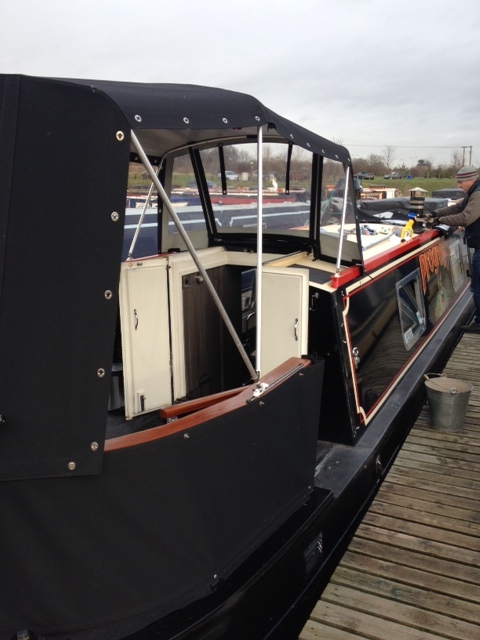 On the bow, we have a large storage box, which also is a super seat for the summer. We have owned nbProgress since the middle of October 2013, so not very long. The sale of our property will pay for our boat. As we are new on the boat, we have no history answer to this question, however, we will be 100% on board as soon as our property is sold. At the moment, we are here for about 5 days out of 7. We nip back, sometimes stopping overnight at the house, depending upon what we have to do. We are doing a few viewings at the moment so bit of running back and forth. Neither of us are working now. I finished full time work about 4 years ago. I have had a couple of part time jobs in that time whilst I was trying to find the right interest. Jim does not work now having given up his job to concentrate on his Dog Training business. We will get some work when we need to (which we will to keep the coffers topped up). Jim has his HGV Class 1 licence and a vast amount of experience at senior management level. I would not want to go back to full time work so anything part time would suit me when I have to. I am also studying Reflexology at the moment and would hope to turn my hand to this once I have passed my exams. At the moment, there is nothing that we have come across that we do not like. We had quite a stressful introduction to boating with three breakdowns in the first three days of being on the water (one of which was the boat builders fault and two which were a fault with the brand new engine, which Barrus have actually been out and corrected). 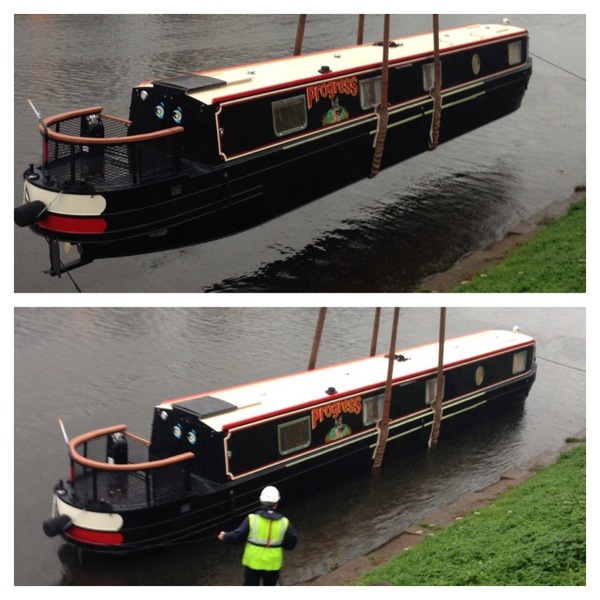 Jim has also taken a tumble into Stenson Lock, which was also a bit hair raising. For him, the biggest loss was his new iphone 5. Luckily replaced through insurance, so he has got over that now. 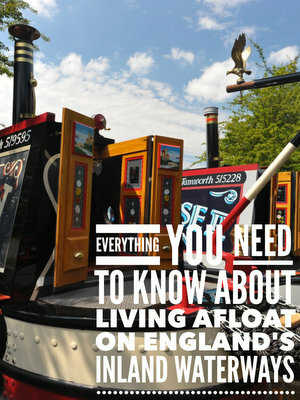 Living on a narrow boat has offered us the way of life that we have always wanted. It is peaceful. We can be in our boat away from everything if we want to but there is a community out there around us, if and when we want to be a part of it. We love the fact that we now do not have the space that we had before, which we filled with stuff that really, we just do not need. We also really like the fact that we have to think about what food to buy, how much we can actually fit in the freezer compartment, or in the cupboards. We used to waste so much just because we did not need to think about what we actually needed. The only thing I would change is to have double glazing. We have a car here in the marina so at the moment, we shop at a supermarket. We do intend to shop as we go along at local shops when we do get out there on the canal. We have a washing machine. Here at the marina, there are washing machines and dryers in a block close by. I have done some washing and then took it to the dryer to get it dried. Whilst in the marina I will continue to do this, especially through the winter as I do not want to have washing lying about. In the summer, I will put the washing on an airer on the stern to dry in the sun. We have a Thetford Cassette toilet. We are happy with this. (Thought that this might be the thing that we would like least but we have coped with this without problem). We only like the blue stuff though. There is no smell with the blue stuff and it works quickly on the contents. We tried some green stuff once and did not like that. We have 3mifi. We have a small aerial on the roof plugged into a little credit card size box located in a cupboard. We have a monthly allowance of 15gb which we pay £15.99 per month for. 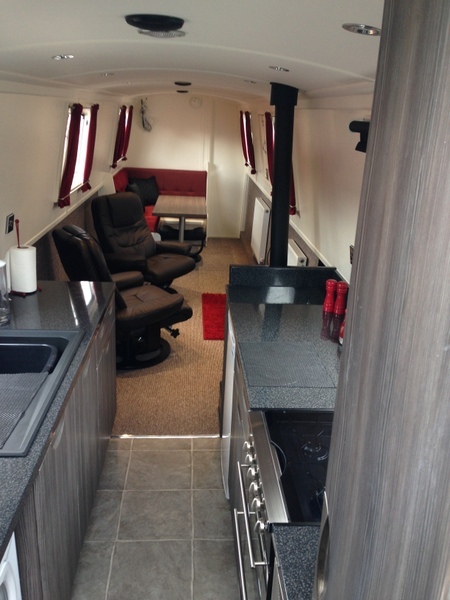 We also have a standby on Mercia Marina wifi which is a years usage, 60gb, or whichever runs out first, £95. We took this out because last week, our allowance on 3 suddenly ran out 2 days before the new month started. This only happened because Jim had to get his new iphone up and running, had to download the new update which ate up 9gb of our allowance. We did not realise this at the time but 3 confirmed where the usage had gone when Jim phoned to query. The only thing was, because we are on a monthly allowance, we could not have any allowance until the new month started. Jim decided to buy some from Mercia Marina to keep for just such moments, or at times when 3 goes down. We have not really explored much yet. We are on the Trent and Mersey Canal here at the marina. I have previously been down to Oxford from Coventry and this was lovely. This was a fortnights holiday. Jim and I have also had a week through Foxton Locks and again this was great. Will update on this after we have done a bit of exploring. Via our diesel engine, Barrus 40. Bank of 5 batteries. VERY. We have central heating although so far we have not used it. We have a multi fuel burner. We have had this going night and day when we have been on the boat. We also have an ecofan although whilst I like to see it spinning around, I am not sure how effective it really is. We have the doors open(only 2 through bathroom into bedroom) and the heat flows quite nicely down the boat. Time will tell whether I am still saying the same thing once we get into those real winter days when it is really cold. The coldest we have had so far is minus 3. I don’t think I would give advice as such but I would suggest they ask themselves some realistic, honest questions. 1. Space – can you live in the space that the boat offers. 2. Belongings – can you honestly do without 70% of the stuff that you currently have in your house. 3. Discipline – can you honestly be disciplined regarding housekeeping, cleaning, washing because if not, you will end up living in a mess. 4. Cold – when you open the door on a boat, the cold is there. If you have dogs, you will have to get the lead and walk them, not just let them out into the garden. 5. Finally (or I will just keep going), think carefully about how the boat layout suits YOUR lifestyle. No-one but you, can say what is best. 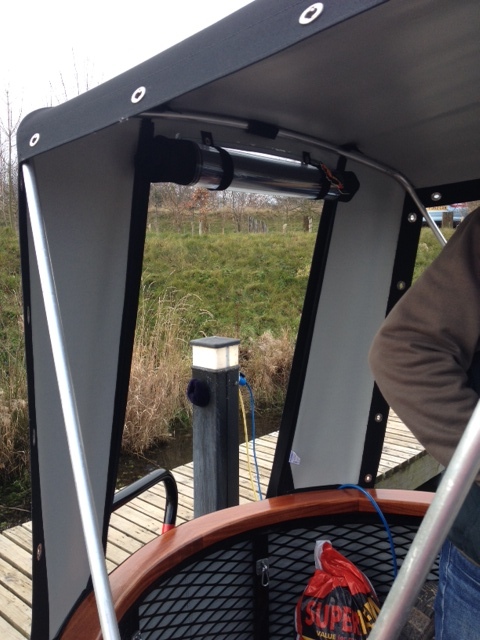 There are options but whether traditional, semi trad, cruiser, narrow or wide or Dutch, its what suits you that is most important and to find this out, you need to look at boats. You can find out more about Kim, Jim and NB Progress here. Thankyou for your response. Once we had made the decision that we wanted to make the move to live on board a narrowboat, we headed off to look at boats. With 5 dogs, the boat had to right for them. As much space in the living area as possible. (we have one big dog and 4 little dogs). We wanted to enter into the kitchen (when you have 5 wet muddy dogs coming on board, you don’t want them all ploughing through the bedroom) so it had to be reverse layout. We wanted a cruiser deck, which we had all meshed and gated so that we can let the dogs on deck when moored so we are not struggling to get leads on in the galley. We are also having a canopy on the deck which will offer us some cover during wet and cold days. Our bedroom is at the bow end so we can shut this off (dogs NOT allowed) so we can have at least one room dog hair free. A lot of the boats that we looked at were very wooded inside and felt very dark. During looking, we were offered the chance to look at a new demonstrator. Very modern, we both immediately knew that this was what we wanted. But, this was our choice of course. I can understand how some people like the traditional feel and look. Then it was a case of sitting down with the boat builder and designing what we wanted. Jim will pm you with a response regarding the business questions. Our dogs have settled well on the boat. We do have to have a routine of taking them out regularly throughout the day. At home, we used to just open the door and out they would go, have a wander round the garden and come in when they wanted but on the boat, in a marina, they cannot do that. I know that if you cc, if moored up, there is the possibility, if you have a plodder of a dog, that they can have the freedom of the canalbank and have seen some dogs just wandering around by their boats. (We could not let ours do that and I would have thought that with Greyhounds that you probably would not be able to either) but I think they soon get used to a new routine. Good luck with your plans. I would say don’t waste time, go for it, but I am a bit biased of course. I look forward to hearing of your progress. There is nothing in the world as precious as the gift of life itself. Sorry for late reply. I read your reply but was able to reply to it. Then today I was looking again and it dawned on me that although I was able to read your reply I wasn’t actually logged in so could reply. DOH! Thank you for getting back to me. It’s so interesting to read about other peoples journey. We will certainly have to be very thoughtful about layout of the boat, especially with 2 large dogs and a medium and one small. They do tend to swallow up space very quickly. I always preferred the reverse layout but what you say just confirms that because of mucky paws etc. A good amount of outside room would also seem an excellent idea. I’m also a more of a modern taste person as well. Same here, we just let them out in the garden (although they do get 3 walks a day). When we have stayed in a caravan for example much more of a routine is necessary because of no garden. It means collors and leads on just to pop out for the loo. We could let 2 of our dogs off the lead (one of the greys and the little Staffie) but not the other 2 so another good point. I would love to be able to make the move but the housing market here in NI is much worse then in England so selling up may take some time. Also my retirement fund is dependant on the property market as well so until it improves we are a little stuck. Yes, understand that selling in NI is more difficult (although it is taking some time for us too although we are now getting some viewings so fingers crossed). I would suggest, if you can, to get a look at some boats well in advance. It is amazing how different they all are. Not only in design, style and décor, but engines and all the other techy stuff which is a bit out of my league. This will bring up questions and there is a lot of support from the guys on this site. If they haven’t experienced it, they will certainly offer some advice. Jim has not been able to pm you yet as he is studying for one of his qualifications but I will get him to do it as soon as he can. Would love to see some piccys of your dogs too. Nice canopy Kim. How long does it take to put up/take down? I will get one this year (house sale permitting) if I do not buy a new boat. Just wondering the same as Alan. Have you got any pics of it folded down? Ours will be a widebeam when it’s finished and we are thinking of a pram hood ready for next winter. The idea of a “porch” appeals but I also agree with Paul’s comments that once it’s filled with stuff you can’t really take it down without a lot of fuss. We would have to be disciplined and not store anything (much!) on the rear deck. I will have a picture of it folded down in a week or so. The guy is coming back to fit sliders on the rear part so that when folded down, it sits actually on the back rail for cruising. Ours is designed in two parts so there is a zip across the middle which splits in two, front part folds forward and back folds back because we have quite a large stern. As for filling with stuff, the trick is – don’t. That’s interesting. I didn’t think about them splitting into two. I wonder if they can be made to fold completely to the back so that just the poles fold onto the roof? Anyone done this? The idea of a mass of cover over the roof puts me off a bit. We have two gas lockers on the aft deck but we can get two bottles in one locker so that leaves one for storage (coal / wood maybe) and then we have seats where there would normally be the rail and they have 2 more lockers under so hopefully room to store stuff that would normally be left out when the cover is on. There are more designs than you think until you come to look at them. 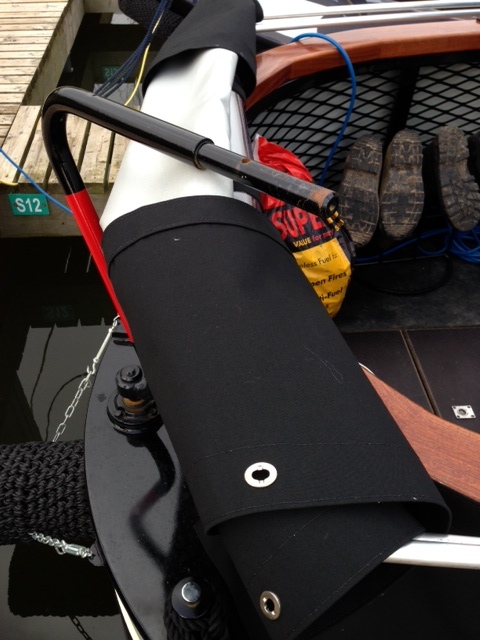 We wanted a canopy from even before we had the boat built, it was part of our design. We managed without it for the first few weeks whilst it was being made and then, on the day we had it put up, I will never be without one again. We are not the sort of people to put up with having stuff stored out in the open. Everything is in its place, in a cupboard etc. Neither of us can put up with piles of stuff about. I don’t know how some boaters put up with stuff all over the place. If I had a cover on the bow (which we cant), I would not have stuff piled in there either so it depends on how you wish to live, with regards to stuff. When the guy comes back to do my sliders, I will ask him about your idea of folding back. You can of course take the canopy off completely. Ours is made in several pieces which all zip together so we could take the canopy off and just leave the poles, of which there are three. 2 fold back and one forward. The sliders ensure that the poles do not overhang the rear rail when down. Hi Kim/Jim ………………. just a quick post to say thanks for the blog/this thread. I really enjoy reading about others’ experiences in our chosen way of life. You pick up so many great hints & tips and get answers to all the questions that pop up – usually daily …… at least in my case they do !! I might even get round to doing the question & answer thing with Paul sometime ! I was up at the chandlery today to pick up some bits & I think I spotted Jim with Ruby. It was me in the rather loud (sorry ! ), muddy Jeep. Just let me know as soon as you’re ready. If ever you see Jim/me with any of the dogs, do stop and say hello. There are quite a few jeeps (muddy and noisy) around here (including ours) so be sure to say Hi. I would be very interested to see photos of it folded down. In particular whether it restricts access to the roof – as a single hander that is obviously essential. Further to my last post , we have had the guy from Wilson Canopies here today, they have fitted an extra couple of studs for us to fold up the front window (can still roll but might not want it fully open in the rain). It was very easy to put up and down. 5 minutes (literally) up and 5 mins down. Took sides off first, roll up back window, release slider (to release tension off canopy) unzip middle zip. Then the front can be folded forward and the back backwards. You can take the covers off completely if required. I asked him to take front cover off so that you can see how the frame sits on the hatch for cruising. Hope the pics give an idea of how it sits once down. Thanks for the pics, Kim. Definitely on my buy list, once I sell the house – unless I commission that new boat!